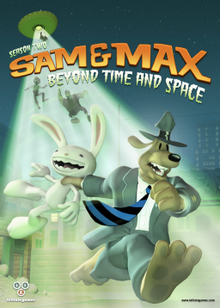 Sam & Max Beyond Time and Space, originally released as Sam & Max: Season Two, is an episodic graphic adventure by Telltale Games based around the characters of the Sam & Max comic series created by Steve Purcell and follows from Sam & Max Save the World. Season Two builds on Season One with more dynamic NPCs, an updated engine, a hint system, support for widescreen monitors, more realistic animations, and more mini-games within each episode. Season Two features a calibration assistant when first run, which allows the player to set their graphics and difficulty settings before playing. Unlike Save the World, where GameTap users were able to access each episode two weeks before it was available through Telltale's website, Beyond Time and Space reduced this period down to one day. The first episode, "Ice Station Santa", was released on November 8 on GameTap, followed by a worldwide release on November 9. However, the second episode was delayed until January 11, 2008. New episodes were thereafter released on the second Thursday and Friday of each month. As with Save the World in 2007, Beyond Time and Space was released on Steam on May 16, 2008. On December 2, 2008. a press event in London, Atari announced a new partnership with Telltale to bring Sam & Max Beyond Time and Space to retail worldwide in 2009. It will be for both Microsoft Windows and Wii. There will also be fully localized releases in French and German, as well as Italian and Spanish subtitles for the foreign language versions of Beyond Time and Space. On February 26, 2009, Telltale officially announced Sam & Max Season One and Two for Xbox Live Arcade. Telltale also officially named Season Two Beyond Time and Space. 4.5 Episode 5: What's New, Beelzebub? Taking place approximately one year after the events of the previous game, Freelance Police Sam and Max return to their office after a "successful" peace summit, only to discover that their pet goldfish Mr. Spatula has turned evil and prepare to execute him. But before they can do so, Mr. Spatula is suddenly vaporized by a giant robot, who is intent on destroying the duo as well as razing the local city block near their offices. After dealing with the wind-up monstrosity, Sam and Max learn that the Maimtron 9000 was actually a gift from Santa Claus. The two head to the North Pole and find the remaining elves in Santa's workshop cowering, as Santa keeps shooting at them with a machine gun. Sneaking down a chimney into Santa's office, Sam and Max find evidence that an evil spirit is running amok at the North Pole, and work at collecting The Four Horsemen of the Apocalypse action figures to use as part of a ritual to bring the demon (Known as the Shambling Corporate Presence) forward so they can capture it and free Santa. However, to their surprise, the demon never had possessed Santa, but rather one of the elves instead, and runs off to distract the Shambling Corporate Presence while Sam and Max work to complete the final part of the ritual: calling forth the three Spirits of Christmas (Past, Present, and Future). Each of the Spirits offers to help, but only if Sam and Max correct a Christmas they had ruined in the respective time periods. After satisfying each of the tasks, the Spirits proceed to help Sam and Max and reduce the demon to a plate of Jell-o, which Santa inadvertently eats and becomes infused with the evil spirit for real. Sam and Max are able to knock Santa out, and after determining that a typo on a shipping label was responsible for delivering the spirit to Santa instead of Satan, send the possessed Santa on his way to Hell. With dawn approaching, Sam and Max volunteer to deliver all the Christmas presents in Santa's place, but drive away in their car before they can be loaded up, with Max stating that there's no rush because it's the middle of November. On returning home from the North Pole, Sam and Max find their friend Sybil being chased by a big triangular portal. Asking Bosco about it, he claims that the portal is actually a Bermuda Triangle, taking things into parts unknown. Though Sam and Max are able to stop the triangle in its tracks, soon after Abe, having went out to investigate what happened, is sucked into the portal, leading Sybil to jump in after him, followed by Sam and Max in tow. After jumping through, the duo find themselves on Easter Island, where Sybil and Abe are enjoy a picnic, but are told by the local Moai Heads that a prophecy will destroy them all. It states that a volcano will erupt, covering the island in magma and destroying the Moai Heads, and according to them, the end is coming soon, and they need Sam and Max's help to stop it. Taking the case, Sam and Max find the entrance to a mysterious cave, guarded by a baby Jimmy Hoffa (Having drunk too much from the Fountain of Youth and reverted to infancy.) whom they need to get rid of somehow. Also around this time, Abe ends up breaking up with Sybil after his continuous ogling of the Wind Moai. Sam and Max eventually trick Baby Jimmy Hoffa into consuming more of the Fountain Water, erasing himself from existence. Having finally gained entrance to the cave, they discover a group of aquatic Ocean Chimps who worship the Moai Heads' giant stone feet. They also find out that the ghost of Mr. Spatula is behind it all, having established himself as High Priest of the group and planning to use a mechanism that controls the volcano to set off an eruption. They also find out that the ghost of Mr. Spatula is behind it all, having established himself as High Priest of the Ocean Chimps and planning to use a mechanism that controls the volcano to set off an eruption. After some puzzle solving, Sam convinces the Ocean Chimps that Max is the true High Priest, but once they succeeded, Mr. Spatula had already set off an eruption which they're too late to stop. However, the two manage to save the island by using a giant Bermuda Triangle, diverting the lava to some place else, but also unfortunately sucking up the Bermuda Triangle back to home, leaving them to have to swim back to New York with Abe in tow, while the Moai heads are left to live on for another thousand years. After the credits, the Moai Heads are seen being lifted out of the ground and into the sky by a bright light. Sometime later, Sam & Max are caught in an elaborate death-trap by a goth vampire named Jurgen, with Max wondering how they got to this point. A flashback starts off the first part of the episode: Having returned home after their adventures on Easter Island, Sam and Max are in the middle of dealing with a zombie attack when the Commissioner calls about a zombie attacks throughout the city. By talking to the C.O.P.S. they find out that the zombies are coming from The Zombie Factory, a nightclub in Stuttgart, Germany. The club turns out to be located in an old castle and run by the vampire Jurgen. Jurgen is far too powerful to confront directly, but by using various vampire weaknesses (holy water, uv light and garlic clove cigarettes) Sam and Max manage to destroy his source of power: his popularity. They pursue him to his back room, where they have the most impressive fight of their career. Since Max remembers that part, the flashback ends and the story is back at the scene in the introduction, with them stuck in the trap after losing the fight. Unfortunately, they've now spent so much time reminiscing that it's too late to escape and the trap snaps shut, killing the Freelance Police. The pair wake up later in the graveyard transformed into zombies and find that they can now understand other zombies but their mortal friends cannot understand them. They return to the back room but find Jurgen sleeping in his coffin and their souls trapped waiting to be shipped off to hell. To make things worse, their souls don't even want to reunite with them. The Soul Mater Sybil got on the Internet is just what they need, but she needs it herself to find a date after having broken up with Abe in Moai Better Blues. Sam and Max eventually manage to turn Jurgen's Monster into the perfect date for Sybil, inadvertently convincing her to get back together with Abe afterwards, and grab the Soul Mater. When they get back to their souls, though, a malfunction makes them end up the each other's bodies. Meanwhile, Jurgen has awakened for a final confrontation. In the end they beat Jurgen by using their combined souls in the Monster's body to impal a wooden stake through his chest, and in his dramatic exit he stumbles into his own trap and has his soul taken by the same mysterious light that abducted the Moai Heads. Just when Sam gets his own soul back (Max gets his back between episodes), their neighbor and fellow detective Flint Paper arrives with bad news: Bosco has gone missing! In a scene after the credits, a still zombified President Max gives a press conference. Looking into Bosco's mysterious disappearance, Sam and Max, joined by Flint Paper bust into his store to look for clues. After messing around in the back room a bit, Sam and Max set of a baking soda and vinegar explosion and are subsequently abducted by a UFO themselves. On board they quickly find Bosco, who has turned into a cow! As they soon find out from the ship's A.I., the UFO harbors a time traveling elevator which Bosco has stumbled into making him inadvertently alter his own past before he was born. Sam and Max use the time machine for some meddling of their own and eventually manage to restore Bosco to his old self, after which the three of them explore the UFO further. But when they get to the next room, they're surprised by the sudden appearance of T.H.E.M. (The Temporal Headquarters of Enlightened Mariachis), who sing a song explaining that they're three different instances of the same mariachi, Pedro, who travel through time in order to perform at everyone's birthday. They also collect souls (including those delivered by Jurgen) as a means to pay for their spaceship and transfer them to Hell through a Bermuda triangle in the soul crushing room, after using the Moai Heads to process them. By the time the song ends the shock is too much for Bosco to bear and he dies of a heart attack, making the mariachis decide to use his soul to fill their quota. Sam & Max use various tricks and much more meddling with time to get all three of T.H.E.M. off the ship and seize control so they can rescue Bosco's soul, unintentionally bringing back two past versions of themselves from Season One's 2nd episode "Situation: Comedy" in the process. After an accidental push of a button activates the Soul Crushing device and sends Bosco's soul to hell, they try to go after it but accidentally trigger the ship's self-destruct sequence. As their past selves make off with the elevator, they have no choice but to go through the portal Bosco's soul was sent through. In the final scene, the spaceship explodes just as it reaches the beginning of time, thereby causing the creation of the universe. After going through the portal, Sam and Max find themselves in a subway station to Hell. When they go up they find that the subway station had been below their neighborhood all along. Bringing the Maimtron 9000 back to life, they use the giant robot to recover the soul token of the recently deceased Ms Bosco and use it to gain passage on a train to Hell, planning to get Bosco's soul back from the devil. When Sam and Max reach Hell, they discover it resembles an office environment and all their dead enemies from past episodes work there as employees. Since Satan simply ignores them, they decide to have a look around themselves. They quickly find out where Bosco's soul is being held, as well as the souls of everyone who's died during their cases. After all of these personal hells are sabotaged Satan has no choice but to talk, and Sam demands that all these souls be released. Satan agrees, but tricks Sam into taking their place himself. Max gets him out, though, and they go have another discussion with Satan. At that point it becomes clear that they have all been tricked, with this latest setback putting Satan in a sufficiently weakened position to be fired by "management", the Soda Poppers!, a trio of former child stars who have frequently crossed paths with the Freelance Police during their adventures. Revealing themselves to be the masterminds, the Soda Poppers downsize Satan and fire him. Determined to keep their evil plot going, each Popper sets out to fulfill three tasks of forcing humanity to recommit the Original Sin, seduce a woman to create a hellspawn, and to entrap a new soul of the 21st century. Thanks in part to some (mundane) items Satan has with him, Sam and Max eventually subvert all of these schemes, and team up with Satan to take Hell back from the Poppers. But the Soda Poppers assume their demon forms and banish Sam and Max into a lava pit below. However, in a deus ex machina set up in Ice Station Santa, their past selves give them Santa's sleigh allowing them to escape. The Soda Poppers are still going strong but are ultimately tricked into using their own banishing ritual against themselves, entrapping them in the same fiery pit and allowing Satan to take back control over Hell. The end credits show Sybil and Abe's wedding, officiated by Max and attended by every character seen so far in the past two seasons. The married couple take off in the still possessed Desto, leaving Sam & Max concerned for their safety. In a scene after the end credits, the Soda Poppers swear revenge on Sam and Max, only to be brutally killed by a massive magma flow from Moai Better Blues, leaving only Peepers' eyes. In addition to the characters already introduced through Sam & Max Season One, Season Two introduces some additional recurring characters. Flint Paper: Flint runs his own gumshoe detective business in the office next to Sam & Max; however, what exactly his business or cases are remains a mystery. As in the comics, his days consist of beating up bad guys and wooing attractive female clients. In season two, he is on a case to track down the man who trashed Mama Bosco's store in the 60s. In Sam and Max Hit the Road, Flint and the door to his office were featured in the second location of the game, where he threw someone out of a window and shot a smiley face into the wall with a tommy gun. Curiously, when asked where he'd been, his adventures sound near-identical to Sam & Max's. Mister Spatula: Max's pet goldfish who lives in the office water cooler. In Season One he was made Vice President of the United States under Max's administration, but he soon developed a lust for power that turned him "pure evil" according to Sam. He becomes the High Priest of Easter Island before Max takes over in "Moai Better Blues". The Maimtron 9000: A giant robot (first briefly seen through a window at the beginning of Season One's Episode 5) that demolishes half of the neighborhood in episode 1, "Ice Station Santa", thought to have been sent by Mister Spatula to assassinate Max. He says his only function is to kill and destroy, but in conversation he will frequently respond to questions by singing pop songs of the 80's and 90's. After being deactivated by Sam, his collapsed body is converted into a casino for rats by Jimmy Two-Teeth. The Maimtron 9000 is reactivated in the season finale by Sam and Max using the portable A.I. acquired in the previous title. Santa: Is the main character of episode 1, "Ice Station Santa". He is seen hiding in his room standing on top of a safe containing the spirits of Christmas. After the battle with the Shambling Corporate Presence, Santa accidentally eats the jello that SCP turned into, causing him to be possessed. After Sam & Max fight Santa again, Santa is sent to hell. In episode 5, he is imprisoned in his personal hell. He must constantly recall toys for various safety issues, while constantly being harassed by demon babies, saying that he hates kids, and took the one job in the world where he'd only ever have to be around children once a year. Jurgen: A German Goth styled vampire, he is the main villain of episode 3, "Night of the Raving Dead", and had a brief appearance in episode 4. He reappears in Episode 5 as a receptionist in Hell and is still angry at both Sam & Max for landing him in his predicament. Pedro: A Mariachi singer who suddenly appears and sings a birthday song whenever a character mentions a personal birthday. He has made brief appearances in episodes 1 through 3, and was given a larger role in episode 4, "Chariots of the Dogs" as well as having a small role in the season finale. Pedro was first named in episode 4. Shambling Corporate Presence: A gelatinous demon from Hell and the main villain of episode 1, "Ice Station Santa". Re-appears as an employee of Hell, LLC in episode 5. Was a minor character in "Reality 1.5", the game-within-a-game in the Season 1 episode, "Reality 2.0". Stinky: A young lady who owns "Stinky's Diner" across the street from Bosco's store. She claims to have inherited the diner, and her name, from old Stinky, her supposed grandfather. The claims (and old Stinky's fate) are questionable, as Stinky is also a constant liar, claiming that she is a very famous actress, inventor of artifacts, and studied beliefs, like "voodoo queen". This causes Sam and Max to have increasing suspicions that Stinky has murdered grandpa Stinky to take over the diner. Sam and Max meet the original "Grandpa" Stinky in episode 4, "Chariots of the Dogs", after traveling through time to the early 1980s version of Stinky's Diner. The older Stinky has a strong dislike for the U.S. government, and has a tendency to exaggerate his exploits, much like the younger Stinky from 2008, though the old Stinky claims to never having had any children. In episode 5, Old Stinky revealed that he had really died in a mountain climbing accident, and girl Stinky is actually his protege. In actuality, girl Stinky is a golem, "The Cake of the Damned," an unholy concoction created by old Stinky from an entree (Fish sticks), a side dish (Tar Cake), and a dessert (Coffee Ice Cream), and brought to life in human form by adding a spare rib into the mix. Timmy Two-Teeth: Jimmy Two-Teeth's son was introduced in episode 1, along with Jimmy's ex-wife and Timmy's mother, Mary Two-Teeth. Timmy is a young rat diagnosed with terminal Tourette syndrome; as a consequence, a large part of his speech is censored (although in a sense of irony, he doesn't really swear, but says stuff like 'Heck yeah' or 'Have a flippin' day'). Despite this, he maintains a positive outlook on life. He dies in episode 5 and his soul goes to hell due to both Sam & Max's intervention (unlike his father, Timmy has lived a sin-free life, but his personal record was switched with Jimmy's at the moment of his death), but later his soul is released and Timmy comes back to life. He is also a great fan of the Soda Poppers (recurring characters from Season 1) and knows everything about them. An ancient and bloated pagan god sends a bloodthirsty war robot to destroy Sam & Max. Sam & Max travel to the tropics where they try to stop a volcanic eruption. Sam & Max crash an emo European vampire's nightclub to stop a zombie apocalypse. Sam & Max team up with Flint Paper to discover what happened to a missing Bosco. Sam & Max travel to hell to confront Satan and retrieve Bosco's lost soul. Episode 5: What's New, Beelzebub? Episode 1: Ice Station Santa received positive reviews. It received an aggregated score of 82% on GameRankings based on 32 reviews and 82/100 on Metacritic based on 32 reviews. Episode 2: Maoi Better Blues received positive reviews. It received an aggregated score of 81% on GameRankings based on 32 reviews and 80/100 on Metacritic based on 30 reviews. Episode 3: Night of the Raving Dead received positive reviews. It received an aggregated score of 80% on GameRankings based on 28 reviews and 79/100 on Metacritic based on 26 reviews. Episode 4: Chariots of the Dogs received positive reviews. It received an aggregated score of 85% on GameRankings based on 27 reviews and 85/100 on Metacritic based on 23 reviews. Episode 5: What's New, Beelzebub? received positive reviews. It received an aggregated score of 85% on GameRankings based on 22 reviews and 85/100 on Metacritic based on 20 reviews. ^ "Sam & Max: Season 2 On Steam Now". Retrieved May 16, 2008. ^ Faylor, Chris (July 25, 2007). "Sam & Max Return To GameTap For Season Two". Shacknews. Retrieved July 25, 2007. ^ "Season Two premiere release date and title revealed!". Telltale Games. Retrieved September 25, 2007. ^ "Sam & Max Season Two coming to retail, Wii". Telltale Games. December 2, 2008. Retrieved December 2, 2008. ^ "Sam & Max Confirmed for XboxLIVE! Arcade". February 26, 2008. ^ "Sam & Max Hit The Xbox Live Arcade". February 26, 2009. ^ a b "Sam & Max Beyond Time and Space - Episode 1: Ice Station Santa Reviews". GameRankings. Retrieved February 19, 2015. ^ a b "Sam & Max Beyond Time and Space - Episode 1: Ice Station Santa Reviews". Metacritic. Retrieved February 19, 2015. ^ a b "Sam & Max Beyond Time and Space - Episode 2: Maoi Better Blues Reviews". GameRankings. Retrieved February 19, 2015. ^ a b "Sam & Max Beyond Time and Space - Episode 2: Maoi Better Blues Reviews". Metacritic. Retrieved February 19, 2015. ^ a b "Sam & Max Beyond Time and Space - Episode 3: Night of the Raving Dead Reviews". GameRankings. Retrieved February 19, 2015. ^ a b "Sam & Max Beyond Time and Space - Episode 3: Night of the Raving Dead Reviews". Metacritic. Retrieved February 19, 2015. ^ a b "Sam & Max Beyond Time and Space - Episode 4: Chariots of the Dogs Reviews". GameRankings. Retrieved February 19, 2015. ^ a b "Sam & Max Beyond Time and Space - Episode 4: Chariots of the Dogs Reviews". Metacritic. Retrieved February 19, 2015. ^ a b "Sam & Max Beyond Time and Space - Episode 5: What's New, Beelzebub? Reviews". GameRankings. Retrieved February 19, 2015. ^ a b "Sam & Max Beyond Time and Space - Episode 5: What's New, Beelzebub? Reviews". Metacritic. Retrieved February 19, 2015. This page was last edited on 19 March 2019, at 03:48 (UTC).